Howey Market Generally Has Our Living Lettuce. Tell them if there are other products of Ours you would like them to carry. Chamberlins Natural Foods In the Orlando Area Carry several of our Products in some of their stores. Unfortunately, the Orlando Home Grown Co Op is no longer in Operation. The following restaurants/resorts use some of our produce. Farm Gate Sales, Please contact me. You can always look at https://yalaha.locallygrown.net/market to see what we have available. We may also be able to supply Fish, chickens and goats when they are available. Contact me to check and arrange a visit. Ugg it is time to do a bit of an overhaul on the web site again. The software I had been using for the “shop” is no longer supported. So, please bear with me. If there is something you would like to order, you can use the contact form to reach me, I’m usually pretty quick about responding to e-mails. Let me know what you want, how many, as well as your shipping address and phone number (in case I have to ship via fed ex or ups). If in FL please include your county for sales tax purpose or I will have to default to Lake County which is a total of 7%. I will get back to you with the availability, price, shipping and total. If you want to buy, let me know and I will send a paypal invoice (you do not have to have a paypal account to pay through paypal.) Or we can discuss other means of payment. Welcome to the official website of Aquaponic Lynx. 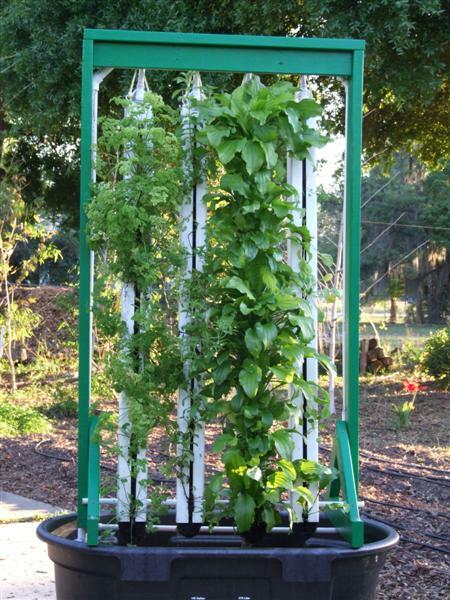 A Florida, USA based company dedicated to helping families grow food naturally. Selling Aquaponics Systems and Products, And Now Farming and selling Aquaponic Produce. “Aquaponics the cultivation of fish and plants together in an constructed ecosystem utilizing natural bacterial cycles to convert fish wastes to plant nutrients. Aquaponics is a natural, efficient, and eco-friendly way to grow food without the worry of toxic herbicides, pesticides or fertilizers since those things would harm the fish and bacteria. Biological and mechanical pest control are practiced in Aquaponics. By adding plants to a recirculating aquaculture set up (or even an aquarium) one can reduce or eliminate the need to change water because the nutrients are now a resource for the plants rather than a pollution for the fish. And by using fish waste as the nutrient source, the hydroponic portion avoids having to buy costly chemical fertilizer mixes to grow plants. Despite the technical sounding nature of aquaponics, an aquaponics system is very easy to install by someone with basic DIY skills in their own backyard. So, what is needed in a complete aquaponic system? For more information on purchasing or building DIY aquaponic systems follow this link. 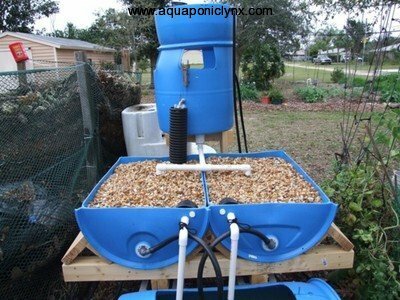 Aquaponic Systems Aquaponic Lynx LLC also carries a variety of aquaponics products for building your own DIY Aquaponics Systems. Some means of adequate solids filtration that will not deplete the rest of the system of dissolved oxygen or introduce negative compounds. How to manage 1-3 is usually rather easy, number 4 seems the most hotly contested topic in aquaponics today. An aquaponic system is a drought proof garden. Aquaponic fish are an additional benefit to the garden. By feeding fish you are also feeding the plants. Water-wise, aquaponics use one tenth of the water than a normal soil garden. An aquaponics system can be set up at waist height and can also be more accessible than soil gardens. Can grow food where there is no soil. You can’t use toxic pesticides. Fish safe containers – whether bought or made yourself. Aquaponic systems, on start up, require a good source of fish safe water. Aquaponic systems can not be left for extended periods of time. What can Aquaponic Lynx do for you? We offer three distinct areas of aquaponics expertise. We have put together for you a selection of systems ranging in sizes from starter up to a size we call ‘Family Feeder’. 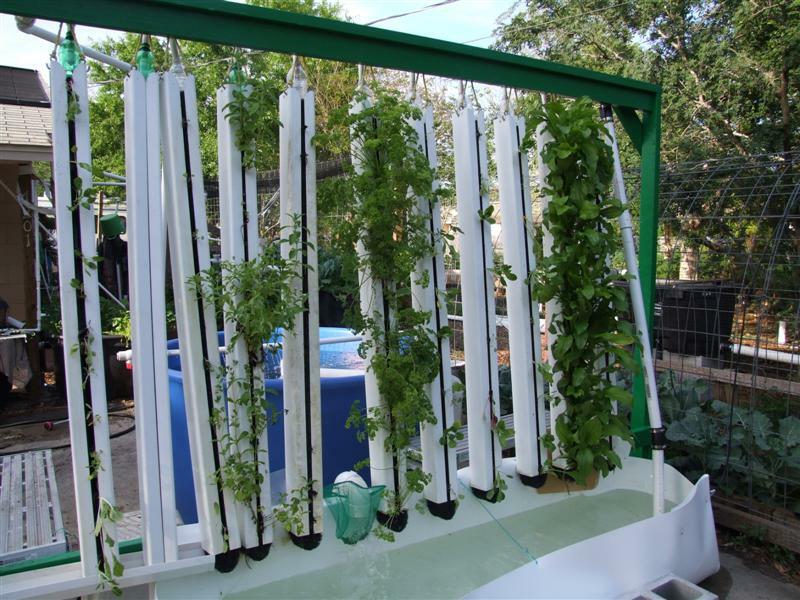 These aquaponics systems come as a complete turn key system in kit form for self-installation. Here you will find a range of special aquaponic supplies, items not easily found elsewhere. For example, aquaponics indexing valve/sequencing valve. We offer a variety of services to help you with either your backyard aquaponics system, all the way up to fully commercial systems. These services include – site assessments, help with with installations, online technical support, custom system design. Due to the internet and modern communications we are everywhere! This means our services can reach you anywhere in the World. Shipping is anywhere in the USA, however, for site visits and installations we focus on the state of Florida, USA.